Before we try out any great and creative ideas, we need to ensure that your garage door is working the way it’s supposed to. Proper maintenance is not only important for when you want to impress that special person on Valentine’s Day, it is essential for the whole year. Correctly caring for your garage door will add years onto its lifespan. Giving your door a quick onceover could reveal any loose nuts and bolts, or any obvious signs of disrepair. You can fix some of these minor problems yourself. However, if more specialized parts need to be fixed, you would need to call in a professional. These include broken torsion and extension springs, or the garage door opener. DIY projects are not encouraged for the garage door as these are complex electromechanical devices. This means that you need to be completely sure that your problem doesn’t require the services of a trained technician. Once you’re sure that your door is working at its best, it’s time to give it a thorough cleaning. You may need specialized cleaning products depending on the material of the door, especially if it's steel or aluminum. You may also need a separate cleaning product if you have a glass door. After the cleaning, you can get on with the painting. Please ensure that you choose a paint that can weather the elements and that’s easy to clean. Once you’ve fixed what needed fixing, cleaned what needed cleaning and painted what needed painting, you can get to the fun task of decorating! 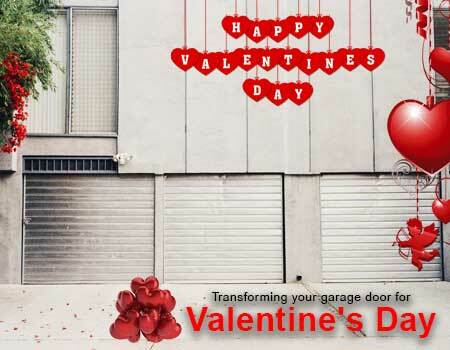 A great idea is to create a larger-than-life Valentine’s Day card on your door. Simply choose your favorite card or find a beautiful picture, and recreate it! We suggest using stickers or decals as permanently painting it might result in a heart-covered door for Halloween and Christmas! If you were hoping for something a bit simpler, magnets will do the trick. They’re really affordable and can be used to write a special message or to create a unique picture. This option works best on steel garage doors. Just make sure that your message is suitable for everyone to see as it will be showcased to the whole neighborhood once it’s up on your garage door! All is not lost if you have a glass door, or a sectional door with glass panels. Glass is perfect for showcasing LED- or fairy lights. You could create a pretty picture or use the lights to write something. The simplest option would be to use a LED heart-shaped light on the door and surround it with magical fairy lights. Simple, but very effective. If you’ve used the same process of cleaning and painting on the inside of your door, you’ve just created the cheapest big screen out there! Just drape a white sheet across the door, switch on the projector and you’re good to go! If you have an overhead garage door, its best to use a decal or picture as you wouldn’t want the door getting stuck on its rollers. Also, make sure any decorations won’t be in the way of your door’s springs or cabling.